A abrupt warning indeed, this Terse To-The-Point Employees Only Warning. Without other qualifiers this general restriction can be posted anywhere needed. 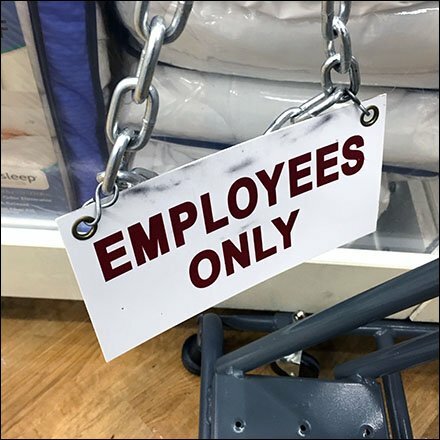 The heavy chain, thick sign substrate, and professional grommets psychologically reinforces the fact that the sign and management means business. But gating the ladder and baring access is a necessity. Kids can’t read the sign anyway, and entry to the mobile stair an attraction to danger. This Terse To-The-Point Employees Only Warning seen at Bed, Bath and Beyond.